Here’s something we never thought we’d see. Airplane food that’s actually appealing! 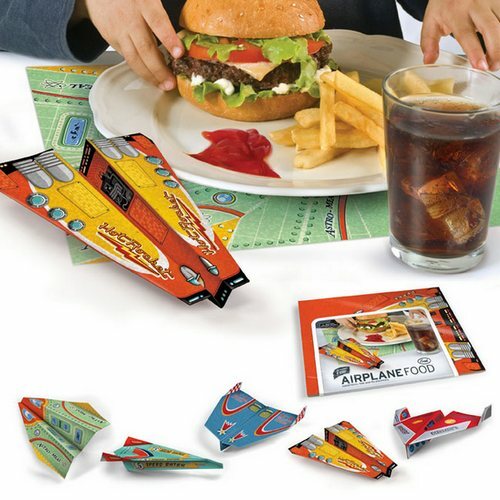 Airplane Food placemats by Fred & Friends will give kids a good reason to fly through dinner. These bright retro-styled placemats turn into supersonic paper planes with a couple of quick folds – those colour-in placemats look ho-hum compared to these beauties. For parents who take on the role of air-traffic controllers, just try to make sure dinner is done before take-off. Five retro designs are included in each pack of fifty placemats and they cost US$11.95 per pack. Fly into Cool Stuff Express for yours.